Guest blogger Miriam Colvin is a dance and movement artist who has been working as the Infusion Teaching Artist at Lake Kathlyn Elementary in Smithers, BC — one of the six schools in the current Infusion Cohort program. Here, Miriam shares a glimpse into an arts integrated learning experience from her second year of working with students and teachers at the school. 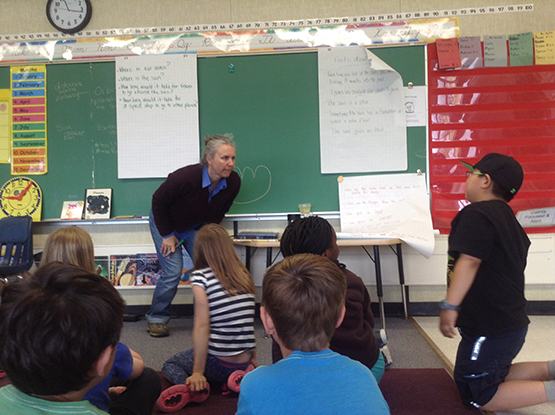 We brought the orbits of our solar system alive with Lake Kathlyn Elementary's Grade 2/3 class. 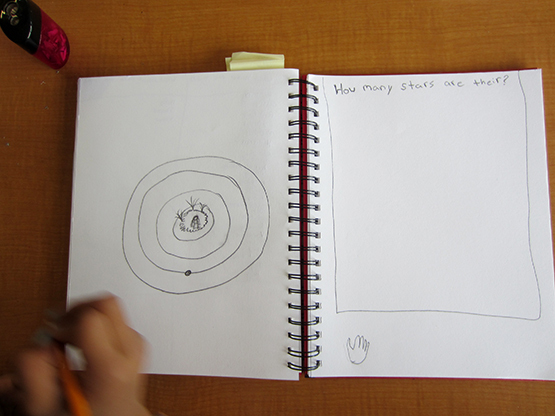 By then end of our explorations, students created a list of questions that could guide the entire Earth Science unit. I worked alongside teachers Shalome Cowley and Andrew Bond and Infusion Teaching Artist Ewa Sniatycka. We began by brainstorming key areas we wanted to cover including the relative distance between planets and the way this distance changes the time it takes a planet to orbit the sun. 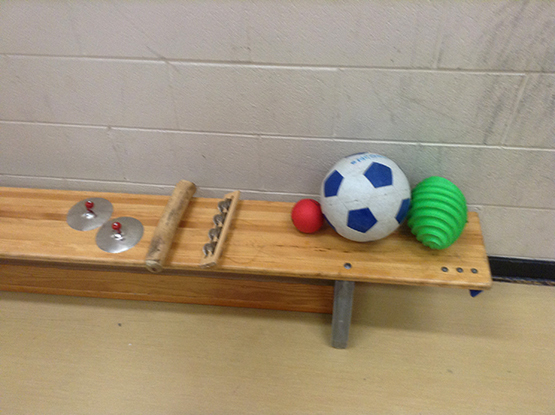 We identified resources known to the students, including a First Nations drum beat and other percussion instruments. Most importantly, we first tried the exercise ourselves to work out the kinks. Thank goodness — we quickly simplified our plan as we laughed at our ambitious design. We also saw possibilities we did not see at first — such as expanding written and movement symbols into music/sound symbols. 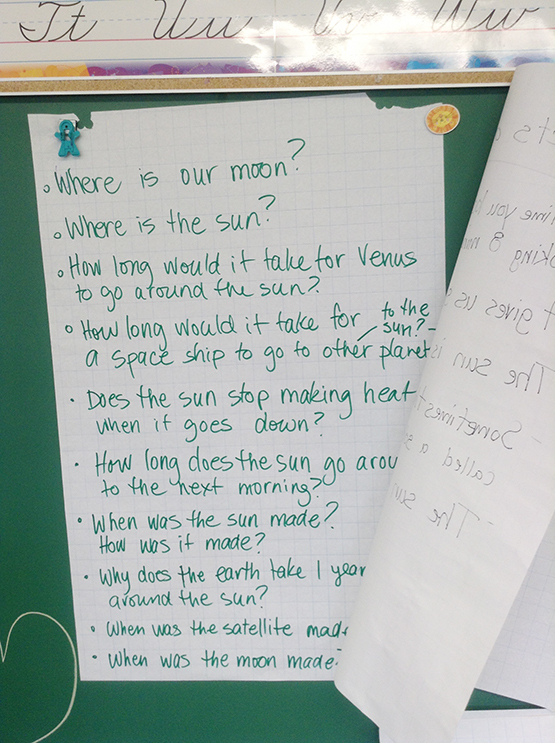 We started in the classroom by asking students what they already know about the solar system and the sun. Building on the work we had done creating symbols for a map unit, students suggested written symbols that translated into movement. For example, 'flare' meant 'throw your hands in the air'. 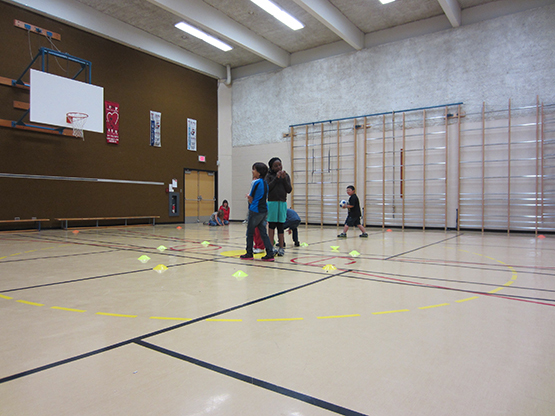 We practiced in the classroom so it was already familiar by the time we walked into the gym. We also reviewed the concept of 'personal studio.' Personal studio is a tool I use in may dance practice - the idea is that each of us works in our own space. A great way to implement this is to have students sit cross-legged and draw their personal studio around their bodies. When they stand, they have space to move with ease and safety. 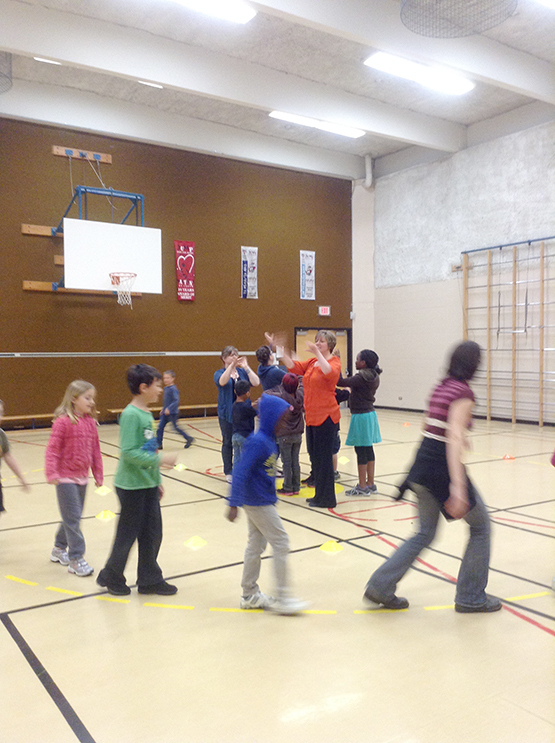 We moved to the gym and all practiced orbiting the sun, walking to a beat. The students took turns being the sun and dancing the symbols as they were called out. We established a second orbit that was further away from the sun. The students identified that Venus was further away from the sun than Earth. We also established sounds for each of our symbols. For example, 'flare' was a chime. 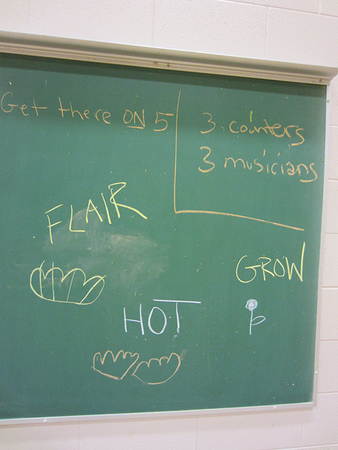 We broke into teams of symbol sounders, sun-dancers, beat-makers and step counters. The Earth orbit walker and Venus orbit walker took a step on each beat and the counters noted how many orbits each person completed in one minute. It was great to where different children's skills shined. For example, one boy with low concentration abilities remained engaged the entire time and demonstrated his ability to walk on the beat for the rest of his class. Students were thrilled to see the Earth orbit walker 'get' more orbits than Venus. Teachers enjoyed dancing the sun-symbols with the students. Students returned to the classroom and brainstormed all of their questions about the solar system — creating an amazing outline of a class plan. We had to cut them off after four pages of questions! 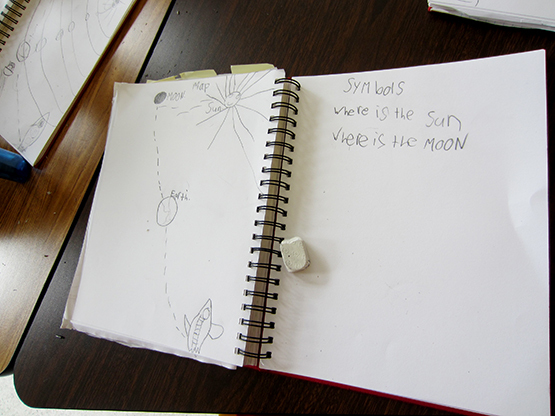 Journaling gave students an opportunity to demonstrate knowledge and capture where they imagined they fit in the solar system. We also used this opportunity to capture additional questions, expanding the self-confidence in this low-literacy class. Ewa encouraged students to said 'I can not write' to write as best they could without help of an adult. It was amazing to see the creativity in the questions that emerged using pictures and misspelled words. This was a fun arts experiment that I would definitely repeat! If the students become confident with this kind of structure, there is room for even more creativity (orchestrating the stars!). The students themselves laid out the questions that they want to explore next — leading the unit with their curiosity.